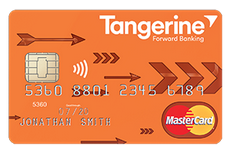 Just a friendly reminder that if you are considering the Tangerine Cash Back MasterCard to apply for by the end of day on January 20th as the introductory offer of 4% for the first three months in your selected categories will be gone after that date. If you apply after that date you will get 2% back in your chosen categories. You can find out more about the card and apply it here. Today only you can get 5x AIR MILES on Rona purchases of $100 or more. Get the coupon here. Finally One Mile at a Time reports that there will be an American Express Centurion Lounge opening up in Philadelphia later this year. As Canadians we can access any Centurion Lounges for free with The Platinum Card or Centurion Cards from American Express. If you don't hold one of those cards but do have another Amex card you can still use these lounges but you'll have to pay a $50 fee to enter. 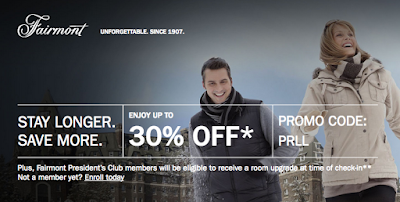 The latest Fairmont Hotels Moments offers are out now. 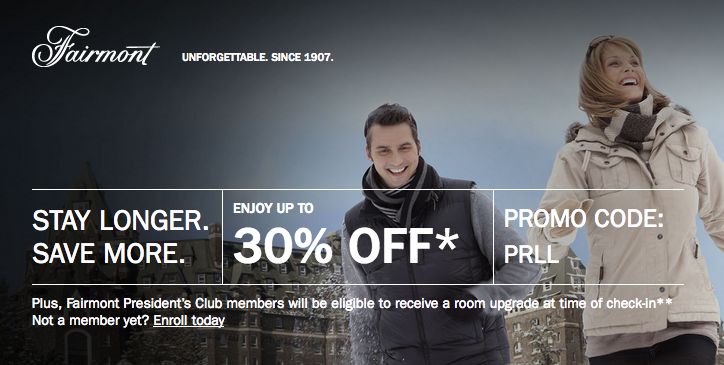 You can save up to 30% on stays at Fairmont and Accor Hotel locations Worldwide. Book by Mar 31 for stays until Apr 30. Find out more here.